It just turns out that tortillas are my absolute kitchen nemesis (besides peeling garlic)! They are messy, sticky, and time-consuming. I love to be in the kitchen — creating and working — and you'll usually find me there, singing, rocking a baby to sleep while mixing, reading oral copy work for my children… but when making tortillas, I'm usually in a less-than-stellar mood. Downright crabby! Recently, my husband steered clear of the kitchen on a tortilla-making day. A few minutes later, however, he reappeared, lurking around like he had something to say. YES! His insight blessed me. Why hadn't I thought of this sooner? I began pouring flour (some buckwheat and emmer) into a bowl with sourdough starter and water, covered it, and let it sit overnight. In the morning, I added a bit more water to adjust the consistency, added a heaping spoonful of bacon lard, and a few generous shakes of salt. Then I heated up our cast iron flat top griddle, slathered some more bacon lard on top, and spooned batter onto the griddle (about 1/3 cup at a time), thinning it into the thickness of a tortilla by pushing the edges with my measuring spoon. After living in Arizona for many years, my family and I love good Mexican food, including the staple: tortillas. With these no-rolling tortillas, my usual hour-long messy endeavor is transformed into a clean, 20-minute fiesta! Makes approximately 13 tortillas. Pour flour, water, and sourdough starter into bowl. Use enough water to achieve thin glue-like consistency. Check consistency (it should still be a bit runny) and add salt and about a spoonful of lard for every cup of flour. Pour about 1/3 cup onto griddle or pan, pushing the dough out from the center with the back of your measuring cup to flatten into tortilla shape. Flip when somewhat browned or to your liking. This post was featured in 16 Recipes and Tips for Real Food Camping and 30 Traditionally Prepared Einkorn Goodies. Ha ha, Tracy! I hope you thanked your husband after that for not totally abandoning you to your fate and daring a suggestion. These look tasty and I’ll have to try your new method. I am truly blessed with a wonderful husband, aren’t I. : )))) Heard good news from our old neighbor about a school being built- wonderful! SO glad you still keep in touch! Say hi to all! Tracy, is there any other starter I could use or kefir or yogurt (both home made) as I HATE sourdough. The tang just turns me off. Just wondering as I am dying to try your easy tortillas. Thanks! I do mine with homemade kefir that I make. I don’t keep a starter, I just keep my kefir, and when I am ready to use flour, I ferment it at least over night about 1/2 C kefir, 1C flour, 1 C. water. I don’t measure I just mix according to consistency. You want it a little on the runny side. What is kefir? How do you make it? Tracey, garlic can be easily peeled by putting the cloves in a pint canning jar with a lid on and shaking vigorously for about a minute. I hope this helps! I think this is a similar process to the Paraguayan tortillas I grew up with, only those are not sourdough and we put grated cheese and minced onion in the batter. I shall have to pull out my starter & try this! And maybe, just maybe, I can combine the two for the best of both worlds! Bless your hubby’s heart, & thanks for sharing! Let me know how they turn out- you have made me want to try this variation! Yes! Thank you. I don’t make tortillas often because it is so time consuming. I’m going to give these a try. I hope it works well for you, Ruthie!!!!! God bless. What a brilliant idea! I hadn’t thought of it, either, but wow, how much easier! Thanks, Kristen. I hope they make your life a bit less hectic! Question: When you combine the first ingredients, do you mix the flour, water, starter, or do you just let them be? I made these two nights ago. First off, don’t think tortillas. Tell your family they are a savory crepe. They will be disappointed if they are expecting a tortilla. They are good, but mine were wet and spongy. I used wheat, but the sponginess reminded me of injera, which is traditionally made from teff. Second, I didn’t experience a time savings compared to my cast iron tortilla press. Yes, the crepes were faster than a rolling pin, but they took as long or longer than the press. I will be sticking with my go-to tortilla recipe from Kitchen Stewardship. Amy, you are right in saying not to expect tortillas. She should call this something other than tortillas- maybe say” tortilla-like bread” or “a different tortilla” (or whatever)… A Mexican tortilla is unique, with its unique taste and method of preparation. Even in yeast breeds, there are different KINDS of breads, Italian is Italian, French is French, etc. you don’t just make a French loaf with all the ingredients THAT bread requires, and call it something else. I’m of Mex descent and hate to see so many crazy recipes being called ‘Mexican’ just because the creator adds a tsp. of chile powder to the dish. Let’s keep our ethnic foods true. I’m curious how you made your tortillas, I made sourdough whole wheat einkorn tortillas n they did not turn out well. They just broke instead of having a soft pliable texture. Hi! Thank your for this fun and easy recipe. I have a habit of not measuring and adding extra ingredients before a I even try the recipe as written. 😉 This time I messed the recipe up, with too much oil, and then added extra flour, some coconut flour, and a little psyllium powder, and baking powder. Needless to say they turned into to flapjacks instead of tortillas! So I added vanilla, cinnamon, stevia extract powder, and baking soda. Looks like a good old fashioned sourdough flapjack! If I did it again I’d leave out the vanilla and use sucanat instead of stevia to see if it made the texture better. Love how you cook with your babies and honor your husband! Yep, I had to do the same thing you did. I just made these and they are coming out more crepe-y than like tortillas. I am using white flour instead of einkorn, could that be it? Or do I need to add more water/fat? Thanks for any insight! Thank you for this recipe! Since the flour/water ratio is 1:1, I just used my leftover sourdough starter instead of mixing and letting sit over night. It worked well. While they are similar to pancakes, they work quite well as tortillas!!! My family is enjoying them a lot. And I love that they are soured to the max, since I used only starter! Can these be frozen? Breakfast burritos sound good and it’d be nice to know if I could prepare and freeze them ahead. Thanks! What size of spoon are you using even you say.. 3 spoonfuls of sourdough starter? Wonderful idea 🙂 Do you have a recipe that is not a sour dough one but is more the traditional flour tortilla? anyone made this gluten free? I was also wondering if anyone had tried gluten free — I have made gluten free tortillas for years but they are HARD. I love to eat them but dread making them every time. I think I will attempt … I have gluten free sourdough starter, so I will experiment and let you know! I have tried these gluten free now and my family loves them!! I simply used 1 1/2 cups of brown rice flour, 1 1/2 cups arrowroot, 1/2 Tbsp guar gum, then I followed the recipe using my gluten-free sourdough starter. It is fantastic…though I must confess the sourdough flavor is new to my taco experience! I’m gonna try this recipe out ! thanks for sharing ! I make homemade flour tortillas and they do not take an hour to make and not messy at all. The trick like anything else is PRACTICE PRACTICE PRACTICE ! Whenever my DDs get frustrated thats what I repeat to them. 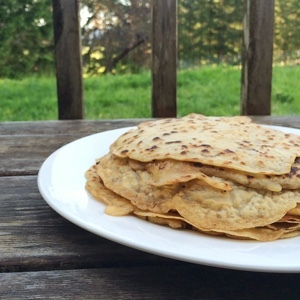 Anyone trying this recipe thinking they will have tortillas will be disappointed….they are sourdough crepes. They ARE easy, and they ARE tasty (because of the sourdough), but they are not tortillas! Also, you will have to grease the pan or the batter will stick. I’m always looking for new ways to use starter, so I will make them again, but they are not tortillas! How large are the spoonfuls of sourdough and fat? Thank you for clarifying. I’m not sure these saved me much time compared to regular tortillas, however, the process was less harrowing in that I was able to sip a tea while watching them cook rather than feeling like a breathless tortilla rolling machine! I used 1/2 cup rye starter and whole wheat flour. It needed close to 4 cups of water because regular WW is more absorbent than einkorn. I also stirred in a tsp of baking soda to reduce the sour taste. The thinner the batter the less pancake-y they were, so maybe some of the other commenters didn’t add enough water? Cool I used a little Baking Soda thinking that it would make them a little chewy. It can take out the sour taste? Didn’t with mine or if it did Wow! Then just make any old crepe recipe. Yeah, these are pancakes, not tortillas. 🙂 I was pretty skeptical, but tried the recipe anyway and they taste exactly like unsweetend sourdough pancakes. Still tasty, just not tortillas. Hi I was wondering what is a spoonful? Tablespoon, Serving spoon? You use the term with lard and the starter so maybe its just not that important? I use about a cup of starter now; will cut it down after seeing this recipe. I also only use maybe 2 Tablespoons of Oil or Lard. Not new to cooking, new to breads. Want to add that I have been making tortillas for years. It is a family tradition. I really like this recipe. Comments have said crepes, pancakes and flap jacks. I don’t care. If it folds and holds and taste good then good. I am playing with tortillas, flat breads and all the rest mentioned previously. Trying to please the Gluten intolerant in my family. Ex-wife, kids, girl friend and myself. I find that most of us can eat Einkorn without problem. Love the no GMO and no over spraying of Round-Up which mimics Gluten sensitivity. Thank You for this site and information. I may be non-traditional but I am all about God and Family. I do not use lard, what can I substitute ? These were great considering you don’t expect them to be exactly like tortillas. You can also make a sweet version with cinnamon sugar and chopped raisins… Possibilities are endless ? Thanks for such a time saving idea. Love it! Btw, garlic olive oil instead of lard (we don’t do pork) is amazing in these!! Just made a small batch as a trial. Used whole wheat flour + white flour. They turned out great. We have a child who needs to eat gluten-free or sourdough. It was nice to have tortillas for him, and they were EASY to make! I have seen several people ask this question, but cannot see any answers. When you say 3 spoonfuls of sourdough starter, what size are the spoonfuls??? Thanks!